Many Parch stories enthusiastically promote social justice. One of three winners of the Editors Choice Award of $100, ‘The Way We Were,’ is a feel-good story with a message of tolerance and inclusion. A group of geriatric were-creatures, living in a dreary nursing home, are isolated by their age and non-human status. They are joined by an aging were-cat, a famous black singer. Miz Kitty is crippled and obese, but still charismatic. When the Neighborhood News announces that “a pack of werewolves” live near a school, an angry mob converges on the nursing home. Miz Kitty wins them over by singing patriotic songs. The author, Fruma Klass, is the widow of science fiction writer, William Tenn (pseudonym for Philip Klass). Kaitlin McCloughhan’s ‘The Hope of a Thirsty Planet’ is one of several stories that, metaphorically, take a moral stand on issues presently in the headlines. Though originally from earth, Rogovan colonists are not allowed to leave their drought-stricken planet. Protective of scare resources, earth dwellers kill Rogovans who attempt to flee to earth. Lin, a Rogovan astronaut covertly living on earth, intends, on her first space mission, to bomb Mars’s “deep space surveillance system,” which enables earth authorities to spot and intercept Rogovan vessels. If the sabotage were to succeed, ships of Rogovan refugees might reach earth unnoticed. Ironically, on Lin’s first space flight, fellow astronauts are warmly supportive of their rookie colleague, but indifferent to the plight of Rogovan refugees. The extraterrestrials, of course, stand in for desperate immigrants seeking to cross America’s southern border. ‘The Well’ by Kenneth B. Chiacchia alludes to America’s blundering interventions in cultures we don’t understand. A human bureaucracy clumsily administers Henit, an arid planet, colonized by two warring alien races. (73). Impoverished villagers have managed to secure human weapons, but lack food and water. Chiacchia’s story contains echoes, not only of recent American wars in the Middle East, but of British rule of India, marginalization of Australian Aborigines, and brutalization of Native Americans during the U.S. Westward expansion. Several Parch stories have feminist themes, equating thirst with sterile or unsatisfying marriages or with violent crimes against women. In ‘Dream Warriors: Ramayan Redux,’ the Indian author, Rochelle Potkar, condemns Indian society for its indifference to sexual abuse of women. Since birth, the detective Kapeesh has had a special affinity with the monkey god, Hanuman. Kapeesh champions two women brutalized by a corrupt policeman. In “Dream Warriors,” the human female victims, their violators, and their defenders are “incarnates” of the Hindu deities that battle in the Ramayan epic. Though one of the winners of the Editors Choice Award, the story, to me, seemed contrived and cumbersome. 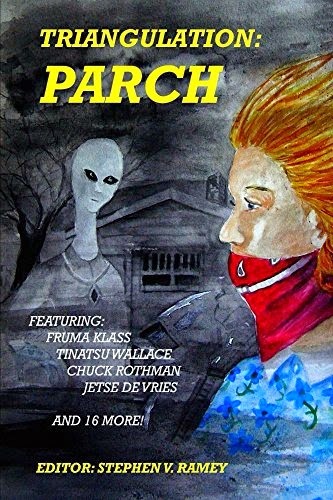 One of Parch’s darkest stories of male violence is the subject of the book’s evocative cover painting by Sue Linville. In Chuck Rothman’s ‘Dust Storm,’ a farmer, barely subsisting on a waterless farm, has grown drunken and violent. When a spacecraft lands nearby, his wife gives their infant son to a female alien, convinced that the child will be better off on another planet. Tinatsu Wallace’s droll ‘Smitten’ is another story of a marriage gone horribly wrong. Before Simone’s wedding night, Dr. Abula had pumped her “full of dopamine, oxytocin, adrenaline—all timed to release at the sight of” the groom (108). A year later, realizing that she no longer loves her husband, Simone asks her doctor for an emergency injection to restore her libido. Married to a philandering brute, Simone construes her lack of sexual response as a pharmaceutical problem. The story is a witty satire on our 21st century dependence on drugs that facilitate erections, help the scatter-brained to focus, ease compulsions, and lift spirits. ‘Smitten’ is one of my three favorite stories in Parch. Besides ‘Smitten,’ my choices for the best Parch stories are ‘A Prayer at Noon’ and ‘Vegan.’ Along with ‘Dream Warriors’ and ‘The Way We Were,’ John M. Shade’s ‘A Prayer at Noon’ was an Editors’ Choice award winner. Its opening sentence—“It was a day into the third sun when the patchwork man rode into town” (1)—establishes the setting: a dusty, extraterrestrial town with a gun culture reminiscent of the American Wild West. As in Stanislaw Lem’s The Invincible, factories, deserted by their human creators, have continued to crank out animate machines: in this case, water-dependent androids that prey on drought-stricken human settlements. The technology of the unnamed planet is a deliciously bizarre combination of machines and living organisms: “The gun shop shelves were filled with every type of weapon imaginable, strange, twisted guns with metallic, clattering timers; guns grown from blast gardens, magical jars, and fungal tattoos” (2). The story is so surrealistic that a synopsis does not capture its deadpan, quirky charm. The Triangulation collections and the PARSEC web page suggest that any lover of fantasy and speculative fiction would find Pittsburgh a heady place. Founded over twenty-five years ago, PARSEC promotes “awareness of the richness of speculative fiction as literature, art and music…”. PARSEC hosts speakers, parties, writing contests, publications, and Confluence: The Annual Literary Sci-Fi/F/H Conference: confluence-sff.org. I am delighted to have discovered Triangulation and will await future collections. Triangulation: Parch is an enjoyable, inspiring read.